A1 series memory card, new form, APP running more smoothly.Shoot, save, and share more than ever before.Capture life at its fullest with the breakthrough capacity of this A1 microSD card. Rated A1 for faster app performance to launch and load apps faster than ever before. Built to perform in harsh conditions, SanDisk Ultra microSDHC UHS-I cards are waterproof, temperature-proof, shockproof, and X-ray proof. The A1 microSD card is rated Class 10 for Full HD video recording performance and a 10-year limited warranty. Durable Design for Use in Harsh Environments:SanDisk Ultra microSD UHS-I Cards are shockproof, temperature-proof, waterproof, and X-ray-proof so you can enjoy your adventures without worrying about the durability of your memory card.Premium Transfer Speeds of up to 98MB/s.Your content moves amazingly fast. Now you can transfer up to 1200 photos in just one minute. All SanDisk products are constructed to the highest possible standards, and rigorously tested at every stage of production, so you can be confident in the outstanding quality, performance and reliability of every SanDisk product. At SanDisk, we understand that everyone has different needs. So we’ve ensured that there’s a flash memory product that’s right for you — whether you’re an occasional photographer or a seasoned professional. Mobile phones with card slots do much more than just make calls; they run applications and allow users to play music, videos, games, and more. With the SanDisk microSDHC Memory Card, you’ll be able to use all your phone’s features without worrying about running out of space. The microSDHC Memory Card turns your phone with a card slot into an entertainment center, holding all of your favourite tunes, as well as your latest holiday photos. You can also use the card to transfer files between your phone and computer with ease. 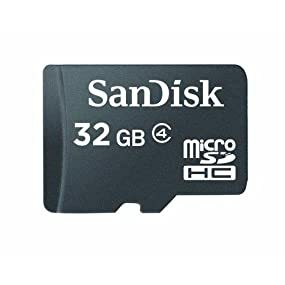 The microSDHC Memory Card provides high transfer performance from your phone to PC, so you won’t experience any hiccups while transferring data to and from your phone to PC. Easily move songs and photos from your PC to your phone with the SanDisk Media Manager software. Available as a free download on sandisk.com, the Media Manager provides a graphical interface that makes it easy to browse your collection of songs and photos. Enjoy photos on your PC, browse album artwork, and add songs and photos to your phone with a single click of your mouse. By selecting the “Fill My Card” option, you can automatically fill the remaining space on your SanDisk microSDHC Memory Card.